Time for a remodeling update!! For those new readers, we are remodeling 15 classrooms, our Multi-Purpose Room (performance and gathering space), Art Department and several academic centers. In a classic portrayal of "you gotta make a mess to make progress"... we've definitely been making a mess! Classrooms were taken down to studs and cement. New electrical wiring, new HDMI and ethernet, new HVAC, new ceiling grid, tiles, flooring are installed or about to be installed. Materials are staged in the hallway for installation. Projectors, screens, TV's and desktops will be moved with furniture in later weeks. We are reaching the precarious stage where it looks like we are behind schedule. We aren't... but appearances belie realities. It's a time of frustration with the mess, weariness with the random power outages/alarms and panic that the Fall Semester is rapidly approaching and the chairs haven't been delivered. As with all disruption... the propensity for "what if..." could out pace the vision. Here is where faith lives. Can learning happen without chairs? Can success occur if the paint isn't dry? Can discussion happen without a projector? I would argue YES to all the above. Physical space can influence, inspire and enhance... but ultimately relationship, human relationship, is what binds us and facilitates growth. But this is a post about renovating classroom space! So... living within individual symbolic and material context, our old excuses to validate stasis are becoming obsolete. Furniture doesn't have to stay in neat rows to symbolize orderly teaching. Students can project and share from personal devices - sharing their findings from their personal location. This shifts the material practice to student-centered activities and away from teacher-centered lecture. Suddenly we find ourselves with limitless possibility... on the cutting edge (if not bleeding edge) of educational practice to support student learning. Exciting and daunting at the same time because our symbolic and material expectations of school are intentionally unsteady. It's a little messy around here. This amount of physical disruption is going to cause some dissonance. The work of redefining the symbolic and material understanding of the classroom is a time for relationship - listening, dialogue and patience... and maybe some Windex and ibuprofen. Classes begin here August 12th... Prayers are welcome. Visitors are welcome in October or so when the paint is dry. Permit me a moment of reflection... and to just start writing again. I’ve been learning how to be an Assistant Principal these past few months. While I do not pretend that I know it all, I’d say I am at a healthy 38% “got a handle on this thing”! I am coming up for air and thought it was time to jot down some reflections. Ghastly Emotional Scenes (GES) happen. The trick is not to get caught up in the drama. Be careful of the Eye of Mordor Syndrome. Running one’s cursory glance over the land to settle with razor focus on one unsuspecting soul. Not fair to anyone to have an overwhelmed administrator suddenly focus and get in the way. Trust and relationship builds success. At the same time, don’t isolate yourself. Trust and relationship builds success. Accept tension. Tension is not bad. Tension reminds us that students, teachers, curriculum, wellness are not an “All or Nothing” to be fixed, solved or fired. It does not all have to happen today. Be yourself – I am still an introvert. I am still pastoral in my leadership style. @JDferries still annoys me from 3 feet away…. In her book “Seven Sacred Pauses” author Macrina Wiederkehr writes for morning prayer, “…May I live with the kind of presence that enables others to feel at home.” In the daily rush and muck of administrative life this has been my prayer most mornings (outside of frantic Help Me! intercessions to varied saints). After that – the rest falls into place. On a cold day in mid-February, The Indiana Department of Education opened applications for their Distance Virtual Learning program. The application qualifies schools to request Virtual Learning Days to cover closures due to inclement weather. On February 26, I received the official word that Brebeuf Jesuit was approved for the IDOE Inclement Weather Virtual Learning Option. In plain words – if we had to close due to snow we could officially take school online and it would count for our mandated 180 days. In my ideal world, we were going to have at least 9 - 10 months of dialogue, reflection and pilot lessons with the idea of hosting a Virtual Learning Day. I am most comfortable working in collaborative process which takes a little time. For better or worse, Mother Nature appeared to have great confidence that we did not need that much time…. Weather predictions for a major snow event began even as I read our approval email. 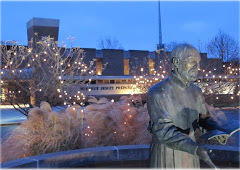 Brebeuf Jesuit is well positioned to hit the ground on a Virtual Learning Day. Our faculty have been 1:1 with tablet based PC’s since 2006. We've been cloud-based with an LMS since the same time. Two years ago we went 1:1 across the whole learning community with our Bring Your Own Technology initiative (see any previous post). We are a Google Apps for Education school. Teachers and students are very comfortable in cloud-based environments. And as you might have read in my previous post, we had experimented most of this brutal winter with keeping the learning moving forward in virtual environments. But a five day turn around was going to put us to the test on how flexible we really are. So what happened? Receive notice from IDOE that we are approved for Virtual Learning Days. I sent out message to faculty and staff announcing our participation in the program. In consult with Principal, we come up with an outline of expectations. This was all done by email. b. Announce Virtual Learning objectives by 8:30am the day of school closure via Edline News item on your class page. c. Link any videos, handouts, readings, planned Twitter chats, Google Hangouts, etc. to that News announcement with clear directions of what student is responsible to complete/prepare/produce. d. Our future weather closure notice will include directions for parents and students to check Edline for Virtual Learning instructions. 2. Secondary sites such as Twitter or G+ Community are fine but make sure the News item on Edline is posted first. This will clearly articulate learning goals to students and parents AND make it easy for me to collect evidence to submit to IDOE. 3. Be prepared to send me a sample of student work after the Virtual Learning Day. The IDOE will request evidence of “time on task or learning growth”. Reflection: Email is less than ideal… especially in this case as the winter storm was already being heavily discussed. On reflection, my excitement to share information took over. More face to face conversation, even in the hallway was needed. Here’s the thing though… almost immediate the brainstorming started to fly. An Ed Tech Newsletter was created to give further samples to clarify expectations. In Jesuit education, teaching is not just about disseminating information and teaching career skills. In the vision of Ignatius and other religious educators, teaching is a vocation, a mission and a labor of love...That love reveals itself primarily in the relationship between teacher and student. Still, I learned a lot over the past week about Virtual Learning Days (beside how wicked awesome the faculty and students are at Brebeuf). Clear expectations are key…. Whether faculty time, assignment scope or student responsibility. Consider recommended “office hours” to narrow time online expectations for teachers. This also gives students the security that they will receive prompt attention for their questions. Consider how much is enough. The idea of a Virtual Learning Day is not to dump 12 hours of busy work in the lap of the students. Reflect realistically on would occur during face to face class time. And yes, students are responsible for the work. You can hold them to the usual standards of assignment completion. We were on a time crunch – but still communicated out via our Learning Management System, weekly online newsletter, email and face to face. Now that we have some time… we’ll be even better. Special shout out to Yorktown Schools who have great examples of parent communication, teacher expectations and student accountability regarding a planned Virtual Learning Day on their website. Has your school tried a Virtual Learning Day? Add your reflections below in the comments... what worked? what didn't? The idea of the Snow Day has changed forever with the Winter of '14. No longer are schools going to consider weather the end of learning. But let's do it intentionally, with clear expectations, clear purpose, in right relationship ... and safe at home. It's been a rough winter here in the MidWest. Schools are scrambling to gather their 180 days in Indiana. But face it, an extra day (or 4) tacked on in May is not going to make up for the momentum lost in January. But hey folks! There are resources out there that can help keep the momentum and the learning going.... well beyond the four physical walls of the school building. Or as we like to say...communicate, collaborate, consume and curate... anytime/anywhere regardless of the weather (unless you lose power like we did in the January 7th storm then you're pretty much just reading by paper and staying warm by fire #17thcenturylearning). As I like to say, "This Ain't Your 1970's Snow Day..." Or at least it certainly doesn't have to be ... although pancakes, hot cocoa and sledding are still allowed (unless it's another one of those polar vortexes in which case I highly recommend this experiment from Minnesota Cold). Send out reminders, reading links or review questions for students. Asynchronous but easily searched. Say #BJPSEng9 if you teach freshmen. No need for your students to have a Twitter account (but most do) – hashtags are publicly accessible on public accounts. You could also make a class Twitter account (in which case it would be @BJPSEng9). Set up a time (say normal class time) letting students know you will be live and online. Send out prepared questions and expect answers. Or just be there to answer student questions. Use a class hashtag for students to follow or read later. Had a small group activity in mind for room 218 period 3? Set up a Google Doc and have students answer questions collaboratively from home. A shared Google Presentation allows students to view or view & edit materials easily. 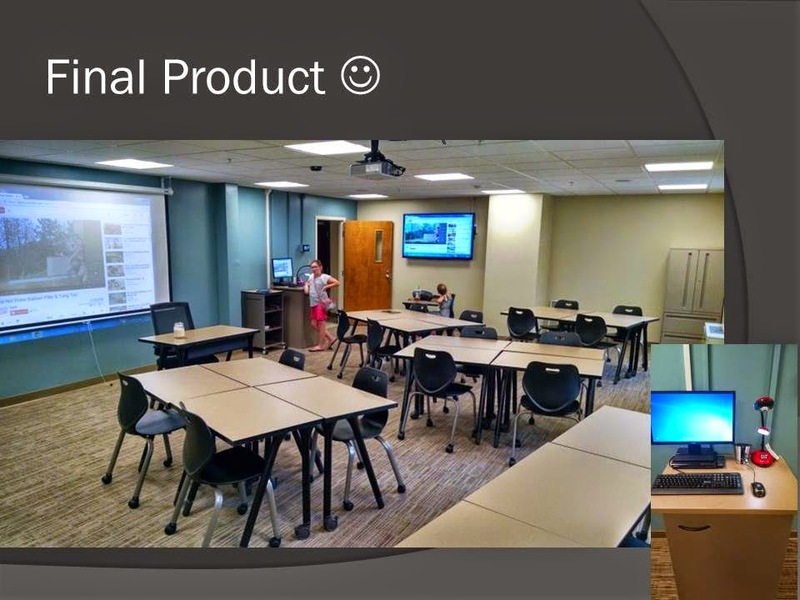 If you have a presentation all ready for “live” class – throw it up to a shared class Folder and have students view outside of class. Google Forms can be turned into a quiz simply by asking content specific questions. Or they can be designed more like a handout where students answer/practice/reflect on topic areas you wanted to cover face to face. 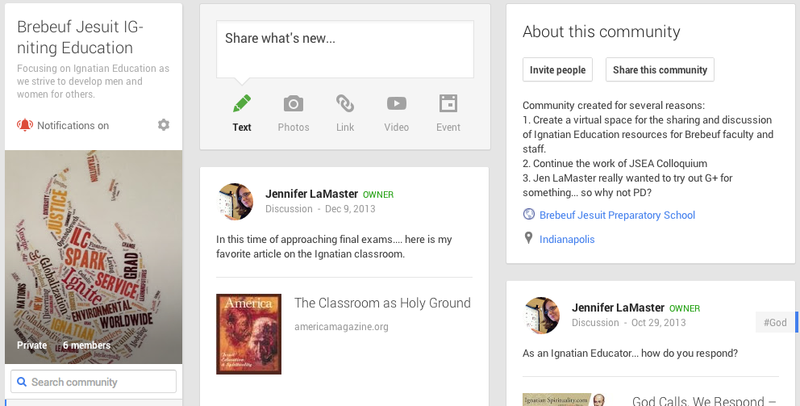 A favorite of Brebeuf Social Studies types… looks like Facebook but you must be an educator to make a page. Students are invited in with a class password. Post videos, readings and links and begin the discussion. Several of our Brebeuf faculty have created their own class pages using various free blogging tools. Check out Edublogs, Blogger and Weebly to start. Try a streaming conference product… heck, it’s a free trial. Check out GoToMeeting or AdobeConnect. Winter can’t last forever, right?